One of the things that scares me the most about my book is that people are going to read it. It’s such a silly fear that I don’t even know what to say about it, except that I want to scream from the rooftops (because apparently that’s how you get all the right people to hear you): I do not think I’m an expert on motherhood! Come look in my house and you will see I struggle with being the right kind of mom every single day! But I believe everything I wrote about being a mother– I know that it is a divine opportunity, I know that it is infinitely important, and I know that motherhood turns me to Christ and helps me become who I should be. That knowledge gives my mothering purpose. Purpose is what gives a person hope. It gives you perspective beyond an inglorious moment. And it gives me something to work toward, because we all understand that knowing something and doing it right are two wholly different things. I saw this video today that explains the basic doctrines of the Church of Jesus Christ of Latter-day Saints. It answers those questions that every human has about the purpose of life: Where did I come from? Why am I here? Where will I go when I die? Anyway, it’s a lovely little clip, and something that I think would be great to share with people to help them understand a little bit about what Mormons really believe. I really do believe what this video talks about. I believe in Jesus Christ, and I believe in God’s plan of salvation. This knowledge gives me purpose. 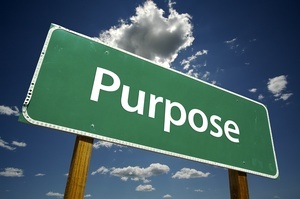 What does purpose mean to you? And how does it make a difference to have one? Countdown the the Family Proclamation Celebration: 3 days! I’ve read your blog for a while and I’m pleased you’re posting again. I’m not a Mormon, and I usually skip the LDS videos on the (surprising number) of LDS sites I read, but I watched this one. Despite reading so many LDS blogs for years now, my understanding of some of the real basics of your faith was not as good as I thought, so the video was interesting viewing, although for me it asks more questions than it answers. Thanks for the food for thought on a Friday night! Aw, thanks, Marianna! It’s great to “meet” you. I promise my inbox is a welcome place for any lingering questions you might have. *snicker*, I thought that said your inbox was a “welcome place for any lingerie questions…” Don’t worry, I won’t ask any, cause I don’t really wanna know. Joking aside, I enjoyed your post. I think what your book is about is exactly what people need to hear- not how to be a good mother, but how to see the nobility in motherhood. I know, it’s so hard to feel noble when you’re covered in poop, or spit up or whatever, but I like to think it’s possible. Like you said it “gives perspective beyond an inglorious moment.” Love that phrase. I have inglorious moments all the time, I probably cause most of them. But I know what it is I’m working toward, and as long as I keep trying, and re-trying, and slowly but surely move in the direction of that ever elusive goal –whatever the goal may be, whether having a spotless house, or getting to church on time, or an even more significant one like instilling righteous desires and determination in my children– I can feel good about myself as a mother and ultimately be happy regardless of whether or not those goals are ever realized. Anyway, thanks for the video, and good luck with your book. Can’t wait to read it! Just want to say, yes, yes, I completely understand the feeling of being afraid of people reading your book. I wrote mine to be read, but it still terrifies me to know that eventually, people are going to read it! I think your pretty brave for sharing so much of your life and thoughts in a book, and here on your blog. I have several friends that are musicians and they are always excited and happy to perform material written by other people but when it comes to their own material they are nervous and get butterflies. It has been described to me as the difference between sharing beautiful music that they already know everyone will love since they love it themselves, and then sharing something that is so personal to them, like a little piece of their soul. I hope that makes sense, I admire your courage. I have wondered and meant to ask you about how you feel about sharing some of what you share when you know that there are people reading what you shared that are at different stages of “Motherhood” than you…does it feel like preaching to the choir, or like you’ve earned your stripes, or neither? I love how you are able to so eloquently string together gospel principles with your own experiences, really nice! Have a fabbo day!